The day of love is almost upon us and I, for one, couldn’t be more excited. I know many people cringe at the idea of Valentine’s Day and all the commercial red-and-pink ephemera associated with it, but I’ve always felt that the atmosphere of the holiday, sans trite Hallmark card messages, is truly heartwarming. And I’ve set out on a quest to bring non-believers into the V-Day fold by finding chic, non-cheesy ways to celebrate. These pretty little wax sachets are the perfect example. 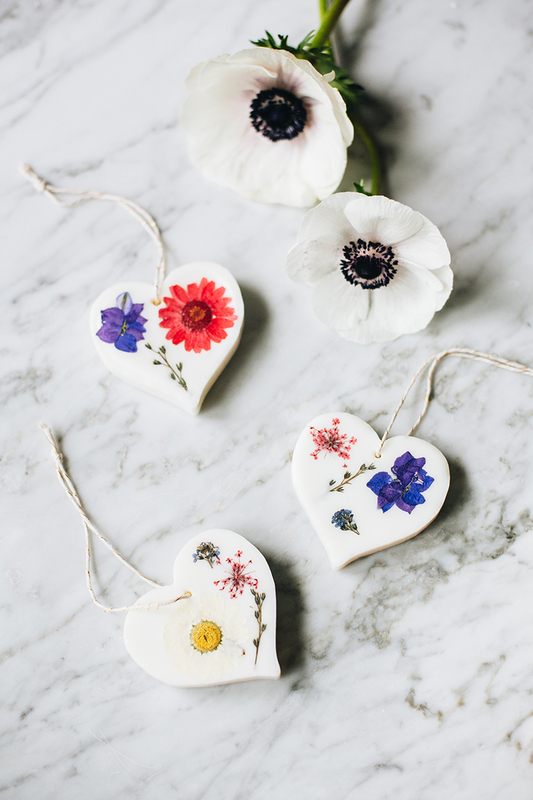 Sure, they’re shaped like hearts and they have pretty little dried flowers pressed into them, but they’re understated enough to display in any well-appointed home all year round. 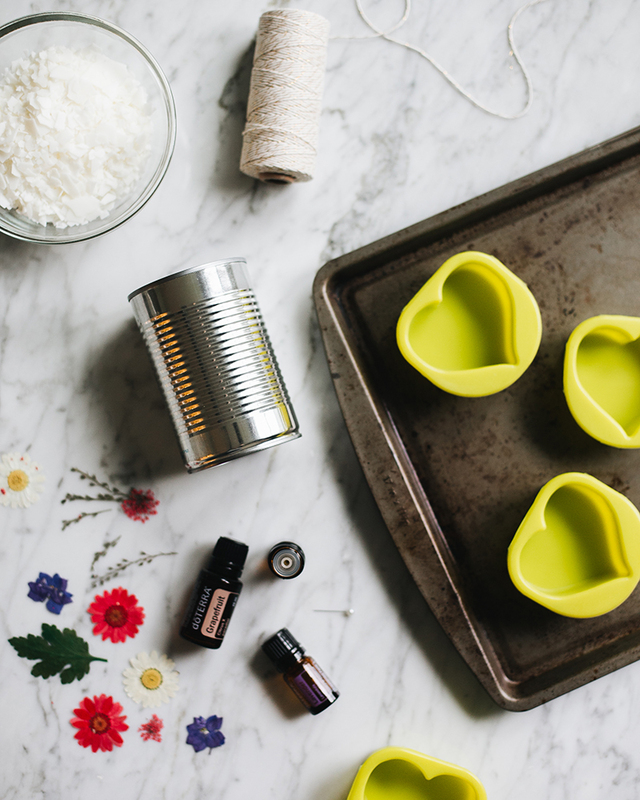 We added a healthy dose of lavender essential oil to our batch so they release a bit of delicious scent in your car, on your bookshelf or in your lingerie drawer throughout the day. They’re wonderfully simple to make, and they make the perfect gift for your friends, family and (most importantly!) yourself. Start by pouring some of the wax chips into your metal can (make sure you don’t melt your wax in anything non-disposable, because it’s super hard to clean the wax off when you’re done). Place the can inside a saucepan filled with a couple of inches of water. Heat over medium heat and stir with a wooden skewer until all the wax has been melted. Add about 20 drops of the essential oil and stir well. 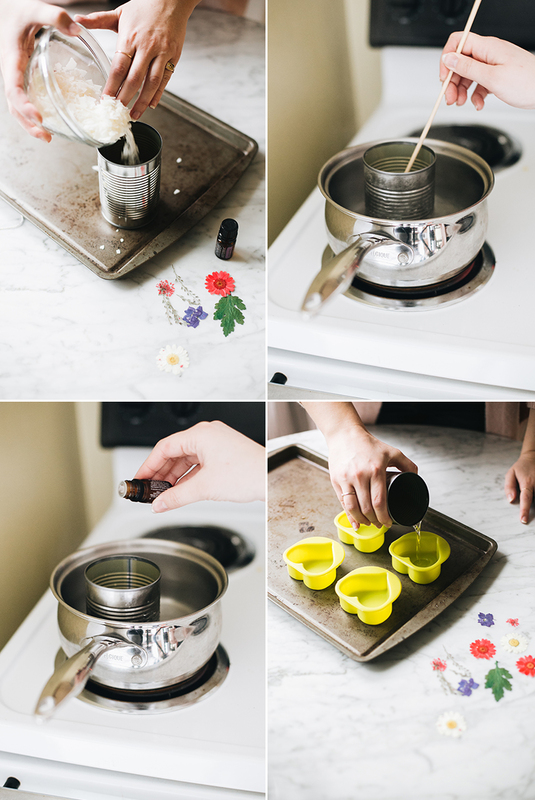 You can add more or less depending on how scented you want your sachets to be, but remember that the scent will be more muted once the wax dries. Lay out your heart molds on a baking sheet, then carefully pour about one centimeter of wax into each mold. Be careful while pouring because the can will be hot! 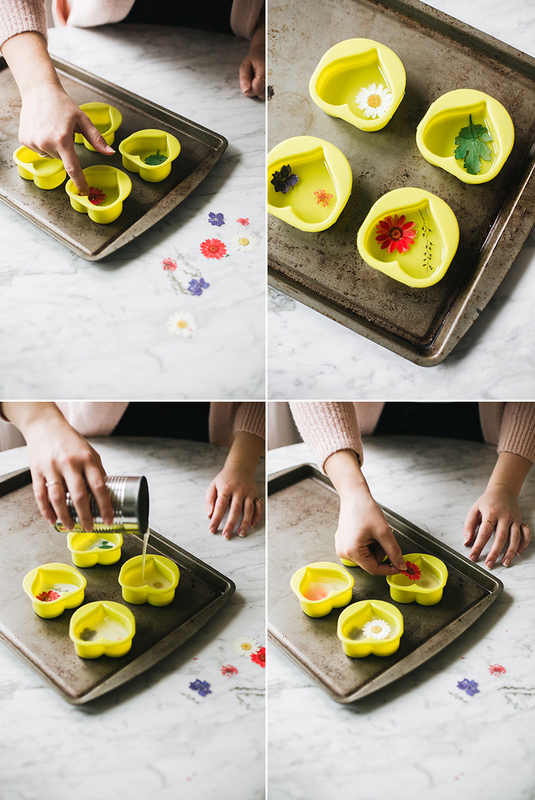 Carefully place one or two of your dried flowers in each mold (the flowers will float nicely atop the warm wax). Then, let the wax dry. You can place the baking sheet in the fridge or freezer to help speed along this process. 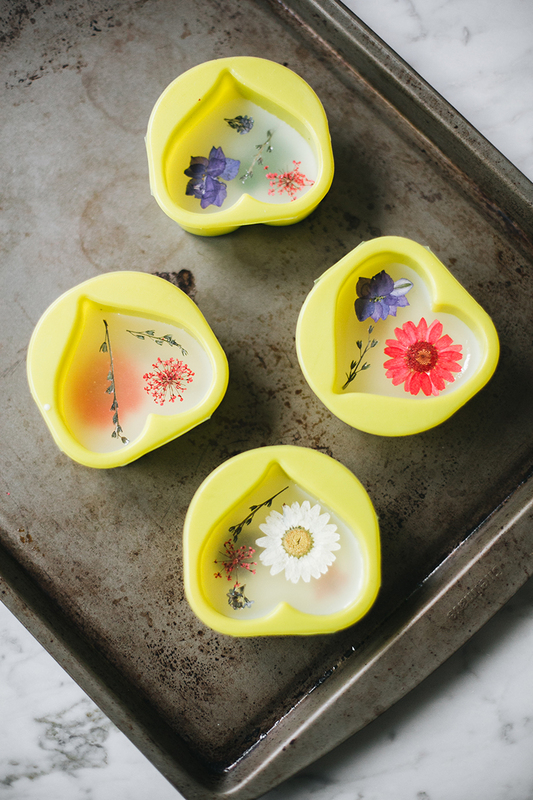 Repeat by pouring another centimeter of wax in the molds and layering with more dried flowers. Let cool. While the wax is cooling, cut a 12″ length of twine. Once the wax is cloudy and firm to the touch but not completely cold, it’s time to remove them from the molds. They should pop out fairly easily, but be careful not to disturb the flowers on top. Using the sharp end of your skewer (toothpicks and cocktail picks also work well for this), gently poke a hole in the top center of the heart. If you go to fast or the wax is too cool, it might crack, so be careful! Thread the twine through the hole and knot it neatly. Now it’s ready to hang wherever you need a bit of beauty and scent! Happy Valentine’s Day to all you lovely people out there! 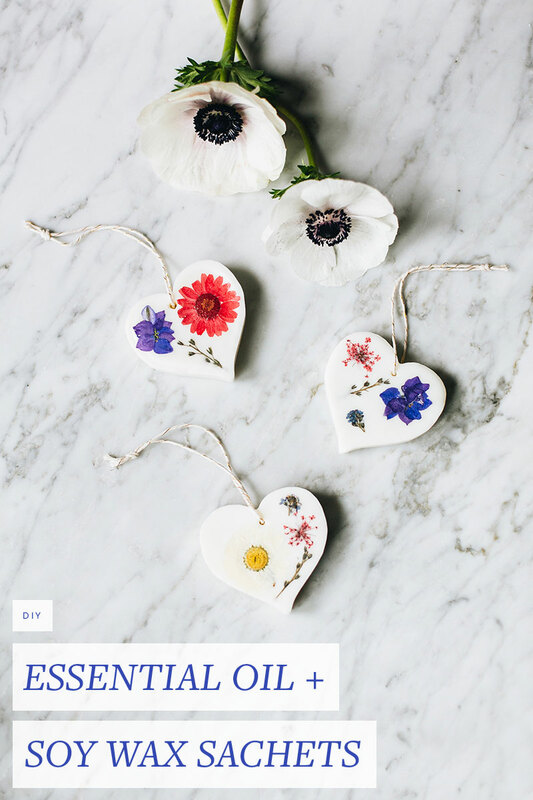 I hope this pretty little project brings love and beauty to your home — and it makes a great gift! photography & styling by Jojotastic, DIY by Hannah Cross.